At OCC Eyecare, you can be sure your patients will be treated with utmost care and expertise. If you are a healthcare professional and would like to refer your patient to one of our clinics for consultation, please download and complete this referral form. If you are interested in receiving COPE and CE credits, learn more about our Continuing Education Events and Webinars, here. 1. Our standard referral forms. Click here to download our form. You can fax these to: +1 (905) 212-1012. 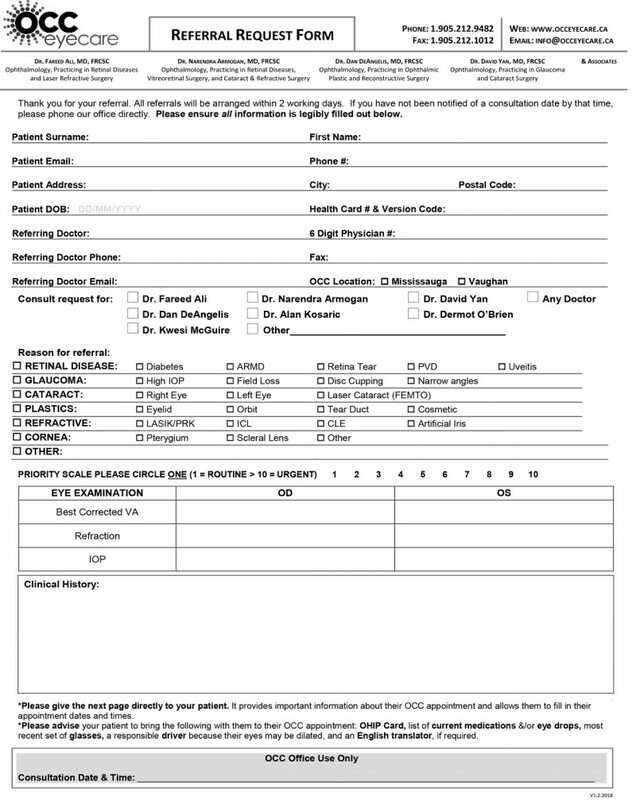 Write “Urgent” on the top of your faxed referral: Be sure that it is legible and prominent. Fax and Call: By calling you are able to ensure your Urgent fax has been noted. We encourage you to use our on-line Patient Management System, The Ophthalmic Patient Easy Referral Automated System, or OPERAS. This system allows you to refer, reschedule and cancel appointments with a faster turnaround time than a standard fax referral request. For more information, you can download OPERAS Instruction Manual. Also, when you register for OPERAS, you gain instant access to our Private Physician Line. Available Monday to Friday from 9:00 a.m. to 5:00 p.m.